Celebrity trainer and cast member of NBC’s Strong, Drew Logan shows us how to rewrite our neurological patterns and break the habits that prevent us from losing weight and living a healthy life. What if we could train our brains to stop weight gain in our quest to be lean, healthy, and fit? Celebrity trainer and cast member of NBC’s Strong, Drew Logan knows firsthand how the brain affects our ability to perform and function at our best. After dying three times in three hours—becoming the world’s only known medical case to survive three sudden cardiac arrests—he lost his short-term memory. He could no longer follow the complicated diet and fitness regimens he’d used on himself and his clients. He needed to create something simpler. He was shocked to discover that the resulting program was even more effective than his complicated regime of the past. In 25 Days, Drew outlines a unique, multifaceted approach that helps readers rewrite their neurological patterning—what lies underneath those pesky habits that get in our way over and over again—so that the brain’s neural pathways, biochemistry, and hormones work together effectively, seamlessly, and efficiently. He defines what neurological patterns are, how they form, and the reason they’re secretly behind why most people fail to lose weight and get in shape. He breaks down these “unhealthy” patterns and shows how to erase them by creating healthier ones with diet, exercise, and a reward system. Included in the book are the 25 Days Grading System, Diet, and Workout Plan, as well as tools that will alert and assist readers throughout the book. 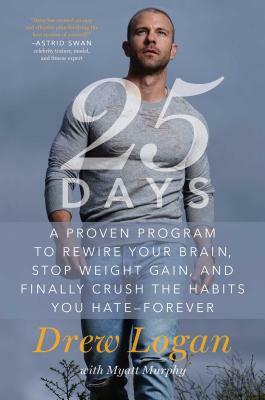 25 Days is one of the easiest—and effective—diets to follow, and Drew will show you that all you need is to adjust your diet and retrain your brain to be in peak shape. Drew Logan is a renowned exercise and nutrition expert, celebrity trainer, and cast member of NBC’s hit TV show Strong. Logan also speaks nationally on health, nutrition, fitness, motivation, overcoming obstacles, weight loss, and taking responsibility for reaching one’s full potential. His celebrity client base includes Keith Urban, Lance Bass, and Nazr Mohammed, and his expertise has been called upon for projects including The Hunger Games, The Flash, The Vampire Diaries, and Quantico. A former consultant for the United States Marines, Logan is currently a spokesperson for the Cedars-Sinai Heart Institute and has made it his mission to raise awareness about heart disease and sudden cardiac arrest. He is the only known medical case to ever survive three SCAs (sudden cardiac arrests). He wears an implanted cardiac defibrillator device to monitor his heart function and has a very special heart therapy service dog, Lucky, who works with Drew twenty-four hours a day. “Drew tells it like it is. No double-talk. No pulling punches. No gimmicks or nonsense. The 25Days workout is awesome, the food is great, and the methods for re-programming your habits are smart...I love it! “Despite daily physical and psychological reminders of his SCA, Drew works hard to deliver an invigorating shock to anyone looking to transform their body! In 25Days…he succeeds!